Cocoa beans are loaded into a small drum coffee roaster. Indi chocolate roasts cocoa beans in small batches for quality control. The resulting product turns into a single dark chocolate recipe consisting of only three ingredients. Seattle is well known for its coffee and microbrews, evidence of the city’s vibrant local culture of foodies who enjoy experimenting with flavors. And you can add craft chocolate to that list. They paved the way for a more recent wave of artisans. Now, dozens of local companies are innovating with chocolate recipes and even teaching people how to make their own. A new book on the topic, "Seattle Chocolatiers," chronicles the history of the emerging scene. 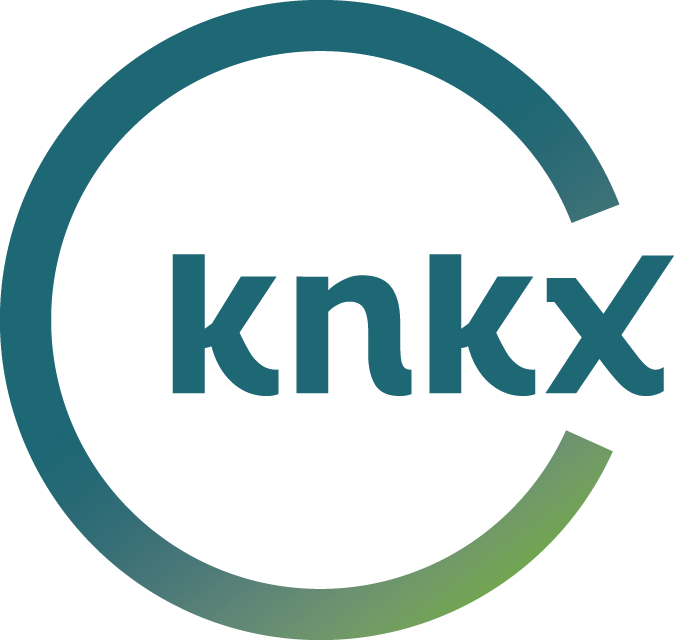 And you can go in person to learn all about the process, from chocolate beans to the cocoa nibs inside them, at the eighth annual Northwest Chocolate Festival taking place this weekend in Seattle. Among the offerings at this two-day exhibition: a deep tasting with meditation on flavor. 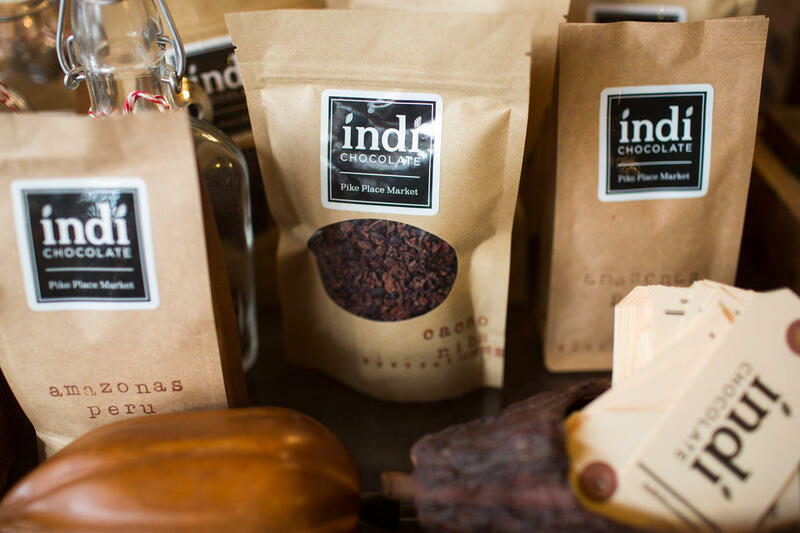 Another great way to experience “bean to bar” chocolate in Seattle is by visiting one of the city’s up-and-coming makers, indi chocolate. The shop is tucked away inside the Pike Place Market, where it will soon be expanding into a larger space. Despite a tough-to-find location on the lower level, the store has a loyal following that’s enabling its growth. 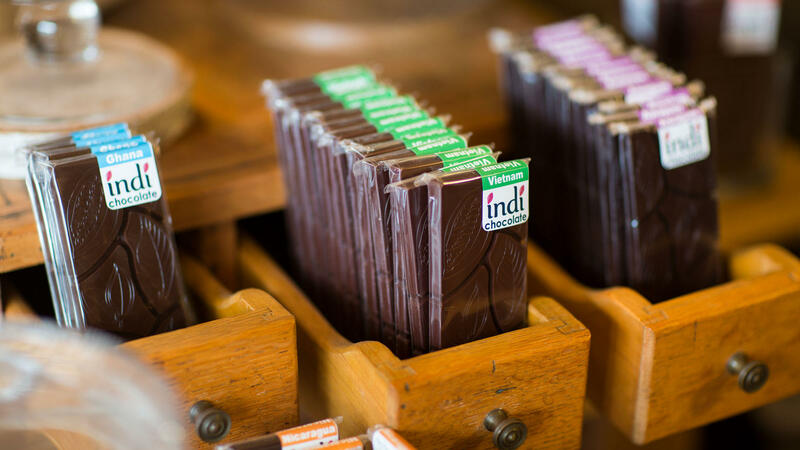 Indi chocolate, tucked away inside the Pike Place Market, the store has a loyal following that’s enabling its growth. 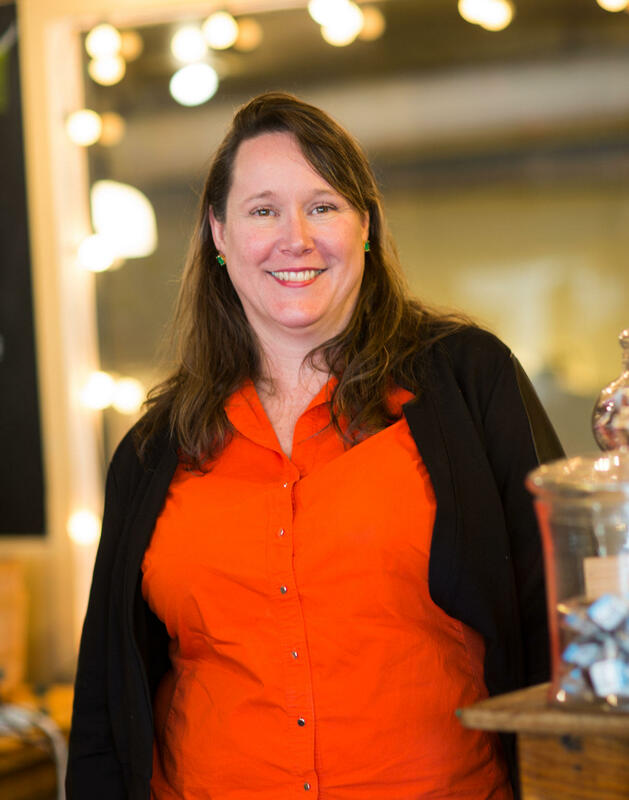 Indi chocolate has plans to evolve into a larger space next year inside Pike Place Market. Perhaps it’s the smell of roasting chocolate beans that attracts customers and keeps them coming back. She specializes in small batches of just 2 lbs. at a time, to ensure the best quality. And she makes that into a single dark chocolate recipe consisting of only three ingredients. “I like to say I’ve gone to the dark side and I’m not coming back,” she jokes, adding that some of her bars also have inclusions of crystallized ginger or dried cherries from Washington state – two of her favorite flavors. But the only other things she adds when making the bars is cocoa butter and sugar. That allows her to showcase the subtleties of flavor in the beans she sources from around the world. Part of the experience is tasting the nibs that are inside the fresh roasted cacao beans you smell when you enter the shop. Crack a bean open and you find the seed-shaped fragments inside. They're 100 percent pure cacao and full of subtle flavors after an initial taste of bitterness that’s surprisingly smooth. It’s easy to see why Andrews has so many repeat customers and people coming back to buy bags of pure beans or the much-coveted nibs. 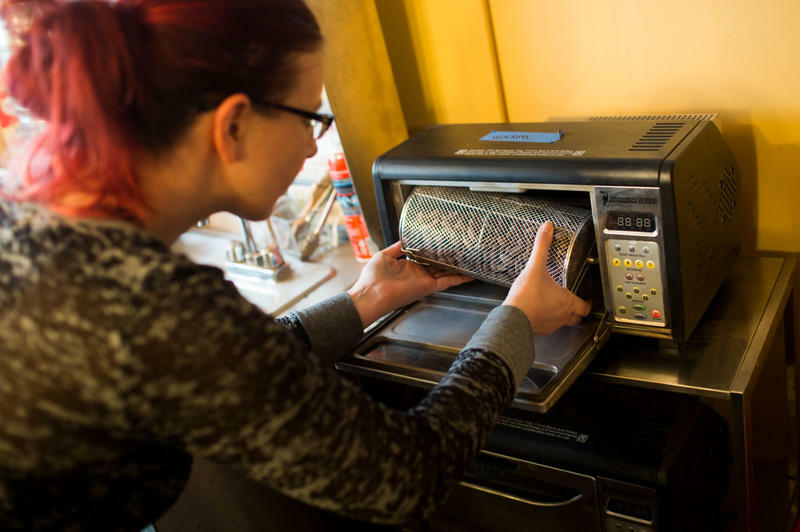 She says bags of the roasted beans have also become very popular among people who are adding them to their coffee grinders for a special kind of “50/50” mocha, in which coffee beans are blended with cocoa beans. “So, it’s a really nice way to enjoy in the morning, either hot or cold – we also do a cold brew with it,” Andrews says. The shop also sells savory spice rubs made from cacao as well as kits for infusing spirits with the essence of chocolate and a line of body care products made from cocoa butter. 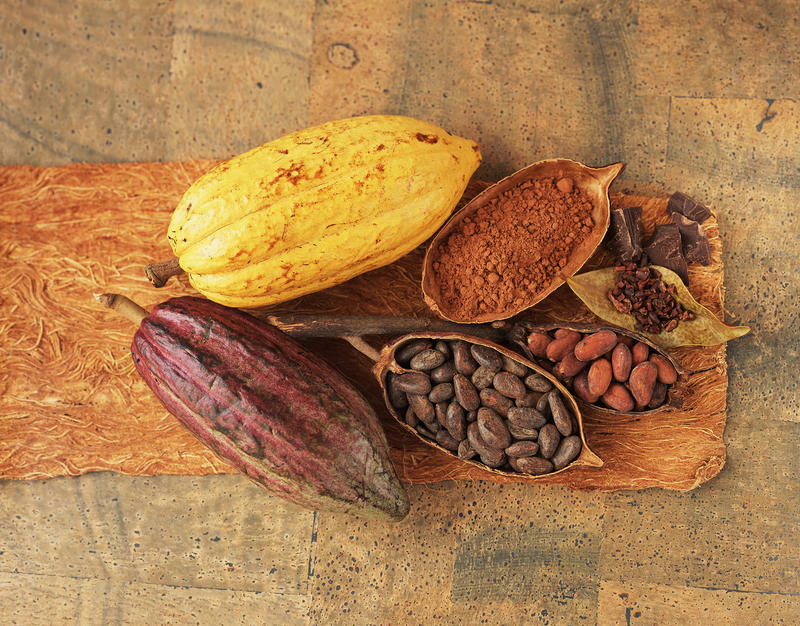 But at the heart of the operation is the use of the fresh roasted beans to teach how chocolate is made into bars. She says the Northwest Chocolate Festival is a great place to do that. She’ll be there this weekend, giving several talks and celebrating the sixth anniversary of her company, which she launched there six years ago. "So it’s always old home week, it’s always another year for us at the festival. And that’s really special to us as a company," she says. "Come join us." The Northwest Chocolate Festival takes place this Saturday and Sunday 10 a.m. to 5 p.m., November 12 and 13, at Seattle’s Pier 91 Smith Cove Cruise Terminal. More information is on their website. You've likely heard that dark chocolate is good for you. 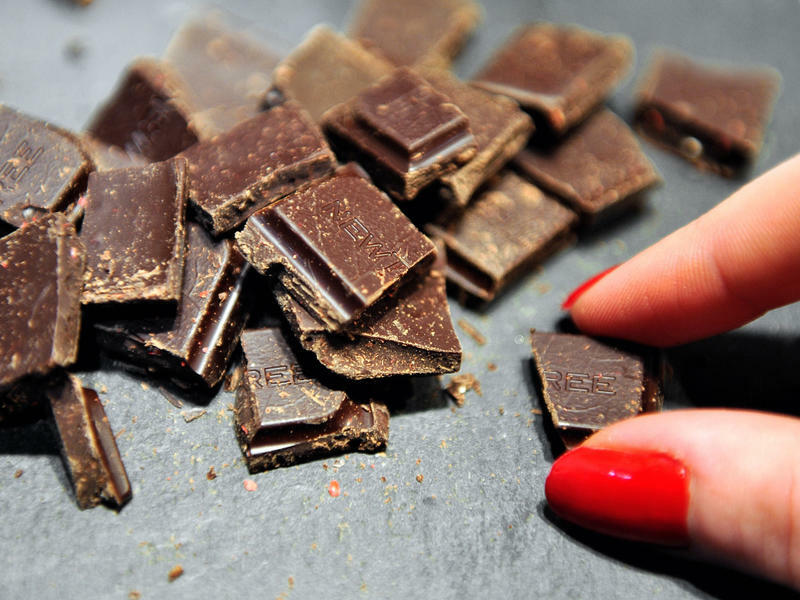 Last year, researchers linked a regular chocolate habit to a reduced risk of heart disease. And, as we've reported, compounds found in cocoa known as flavanols or polyphenols have been shown to improve vascular health by increasing blood flow. 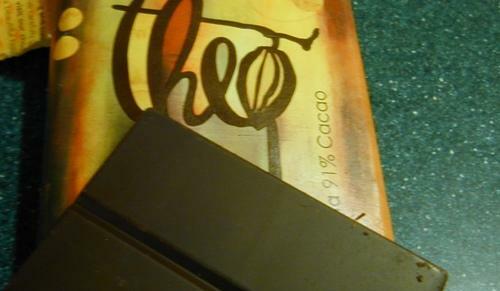 Seattle-based Theo Chocolate is known for its focus on sustainability and fair trade. But a new report says the company doesn’t deserve its "Fair for Life" certification because it tried to prevent workers from unionizing a couple of years ago.